This amazing formula is also safe for sensitive and acne-prone skin. 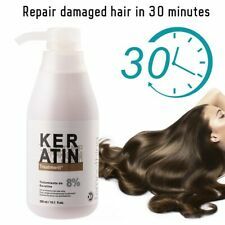 1box x Keratin Repair Hair Mask (2pcs). ANTI-ITCHING: Help relieve dry and itchy scalp. ARE YOU TIRED OF YOUR HAIR LOOKING DRY AND FRAZZLED?. Net Content: 300ml. If you do not receive our reply within 48 hours, pls. If you are satisfied with our service, pls. Net Content: 300ml (8%). 1 Bottle of Hair Keratin. Reduce the fluffiness of hair and make the hair more shiny. Perfect for repairing dyeing and perming, strengthen hair toughness and elasticity. If you do not receive our reply within 48 hours, pls. Ergonomic Handle –The Titanium Plate Flat Iron handle is ergonomically designed with quality plastic to ensure that it insulator heat from within hair straightener. Steady heating, hard & wearable. 1 x Hair Straightener. For every 50ml straightening paste, add 10ml PURC OPLEX No.1. Product category: hair mask, film. Applicable hair: general. Model Number:Hair straightening cream set. Rinse the hair, do not use shampoo, and dry with a towel. Net Content: 300ml (8%). 1 Bottle of Hair Keratin. Perfect for repairing dyeing and perming, strengthen hair toughness and elasticity. Reduce the fluffiness of hair and make the hair more shiny. We would highly appreciate the chance to follow up with you if needed. 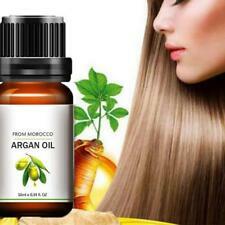 Promote creation and accumulation of Keratin to make hair stronger. Conveying necessary nutrients and oxygen to nourish hair roots. Help take care of the problem of hair dry. Increase hair brightness and health. Hair straightener 1. Features: Negative ion hair care. Ceramic coating. Product net weight: about 367g. Instruction manual 1. checkout, it can't be changed once order completed. Orders placed on weekend will. Swivel Cord– The swivel cord allows free-ranging motion so you can curl and style at an angle. Never use it near bath tub and shower,keep away from water or humid areas. 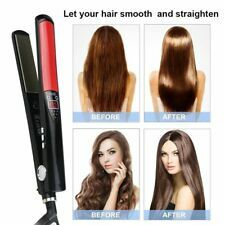 Ergonomic Handle –The Titanium Plate Flat Iron handle is ergonomically designed with quality plastic to ensure that it insulator heat from within hair straightener. Hair straightener 1. Features: Negative ion hair care. Ceramic coating. Product net weight: about 367g. best give a satisfied solution. for it free. To Other Country. Promote creation and accumulation of Keratin to make hair stronger. Help take care of the problem of hair dry. Conveying necessary nutrients and oxygen to nourish hair roots. Increase hair brightness and health. Pure Brazilian Keratin Hair Care. 1 x Scunci InstaBoost Mini Crimper. 1 x Heat Mat. 1X 300ml Hair Care Repair Healing Cream. Shake the bottle well. Apply to hair with brush using 1/2 sections. (Gloves should be worn for this application). - Straightening hair. (Shampoo does not contain sodium Chloride). Net content: 300mL. Applicable hair: general. 1 Hair care agent. 1X 1000ml Formaldehyde Free Keratin. - Straightening hair. Type:Pure Brazilian Keratin Hair Care. What Is Keratin?. It's a protein that's naturally in your hair. (Gloves should be worn for this application). Net weight: 20ml / 0.7 FL.OZ. Notice : Suggest you can use hair growth essence together with PURC thicken hair shampoo, and together with Hair Growth Spray, that can better and faster grow hair ! Inject 3ml hair growth essence into each 100ml shampoo and stir it evenly for use. Net content: 300mL. Applicable hair: general. Straight hair. 1 Hair Care Straightening agent. Model Number: Keratin. Ingredient: keratin. Funtion: keratin hair natural. Feature: keratin hair straightener. Apply hair mask on hair, don't touch scalp, constantly massage hair for 2-5 minutes. with high technology--- imported raw materials combined with fine molecular technology, 5 seconds. Wash hair with shampoo. Natural keratin formula gently cleans hair, straightens hair and relieves hair loss. 1 Shampoo Set. Provide instant nutrition, eliminates frizzy hair, enhance smoothness and gloss of hair. Quite easy and convenient to use, no worry about misoperations. Efficacy: Improve the edgy, vertical fall smooth, strong hair quality. NET content: 10mL. You can follow below process to chontact us. 100% new high quality. Help take care of the problem of hair dry. Promote creation and accumulation of Keratin to make hair stronger. Increase hair brightness and health. Conveying necessary nutrients and oxygen to nourish hair roots. Type: Pure Brazilian Keratin Hair Care. Shake the bottle well. Apply to hair with brush using 1/2 sections. What Is Keratin?. It's a protein that's naturally in your hair. With a heat resistant comb, divide hair into 4 sections. Model Number: keratin. Ingredient: Keratin. Shake the bottle well. Apply to hair with brush using 1/2 sections. (Gloves should be worn for this application). - Straightening hair. (Shampoo does not contain sodium Chloride). For very resistant, coarse hair, allow hair to absorb solution for 30 minutes and blow hair to 100% dry. Brazilian keratin straightening: Straightening hair. Special: keratin hair straightening. NET WT: 200 ml. Funtion: Daily shampoo and daily conditioner for keratin. Type: shampoo and conditioner. 1X Daily Shampoo. 1X Daily Conditioner. For the crowd: All of type hair. Net:100ml/ Bottle. Expiration date: 3 years expiry date ( Havn't open product). WHAT IS KERASTRAIGHT ULTIMATE?. KeraStraight is an evolution in straightening and repair. WHY KERASTRAIGHT. These incredible repairing agents rebuild the hair with added elasticity, strength, vitality and shine providing a smooth, soft and straighter finish that lasts for up to 4 months, gradually fading from the hair. Fragrance type: green apple flavor. Reduce hair fluffiness. Applicable hair: general. And makes hair healthy smooth! 3 keratin 0 Regenerative mask. No Irritation on eyes. 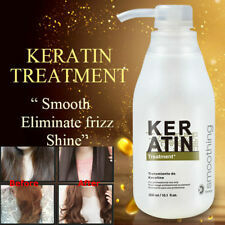 ·What is Keratin?. 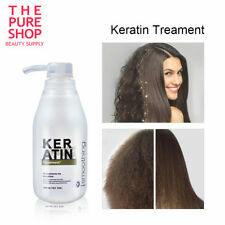 Keratin is high in sulphur and the amino acid cysteine, which make it tough, elastic and insoluble. It is the main protective substance in our hair, skin and nails. 30ml Pre Shampoo to open the hair cuticles in preparation to absorb the keratin.